I spent last week at the beach with my family. It was heavenly. Although the temperatures on the east coast were in triple digits you would have never known it in breezy Isle of Palms, SC. I thought I'd share a few pictures of my trip. These are all taken with camera phones & instagram, but I thought they were still worth sharing. This is a whole table of handprinted linens. 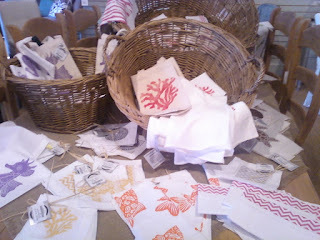 It looked like the images were stamped on to the linens in bright, bold colors and some white on natural linen, too. After my hand printed stint, it was great to see that this art form is appreciated outside the crafty community too. This is from the same store, GDC, in Mt. Pleasant. 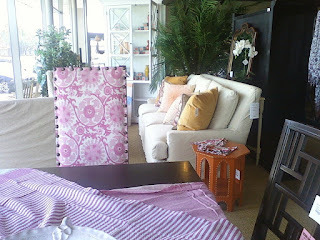 It always makes me want to start over with decorating our home. I love everything they have. Ever. Seriously. I should have taken more photos. I spent a long time working on my quilt for Handstitched Camp, and I still have a LOOONG way to go! I even cheated and did not fill in the quatrefoil squares. This is the only picture I have from the actual beach. This was from Tuesday, our one bad weather day. Things were rainy most of the day because of the hurricane. The sun came out after dinner and we headed down for a walk on the beach. All was well until the wind started blowing. As you can see above, Will thought it was amazing. He just stood there, face to the wind, marveling at how the sand looked like smoke. Jack went running for the house. So different! 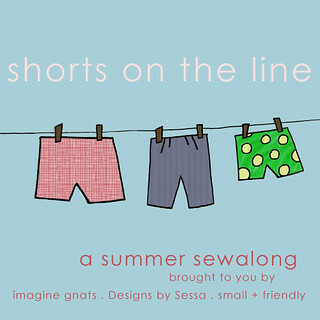 Tomorrow you can find me over at Imagine Gnats for my Shorts on a Line guest post! So glad you had fun and that the weather was good for you. I love the GDC store too! We are headed there in a few weeks- hope the weather holds for us too. Such pretty images. 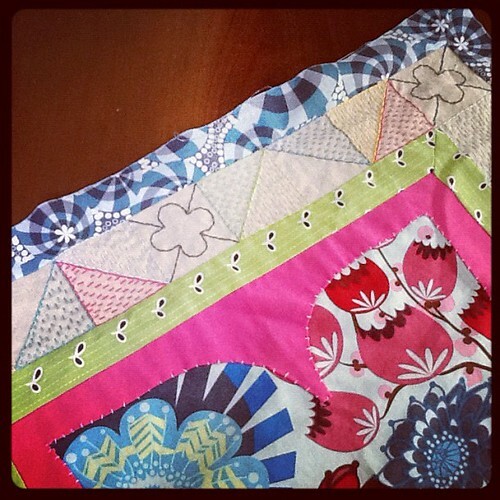 Your dogwood quilt looks great!